Ewing’s responses to “what makes the X-Men” were the highlight of this. Though his comment about the X-Men not hating and fearing was definitely interesting. It was a really good discussion in all. Though, as an aside, I tend to view the X-Men not as family, but as community. Fantastic Four are family, Avengers are friends, X-Men are community. That’s how I think of it. As for X-Man I want to get a solo: Karma. I love Karma, and she’s a fascinating character with so much potential. I am super excited at the very idea of a Beast solo series. If he had to team up with another Beast, I think Dark Beast and Beast would make for amazing stories. Can’t wait for X-Terminators next week and the sensational character find of 1988, Crotus. That cold opening was a thing of beauty for ever, and everyone involved needs to take some time to feel Really Good about themselves for it. Sometime I’d like to see a series set in an alternate 616 where the events of 1980 in comics happened in 1980, most especially the downtime end of Days of Future Past. So Kitty’s now 48 (and might have replaced Obama as Illinois’ junior senator, if the creators want to take it that way). I was fascinated to hear Claremont say, in the wonderful #100 interview, that he’d planned to have heroes retire and go on to other things – I loved that in vintage Levitz Legion of Super-Heroes and would love it for X-Men, too. The hard part would be making sure it doesn’t turn into Yet Another Generic Dystopia. There’s an old interview with him from when he was just starting up the New Mutants and notes that he wanted to have a high turnover of students, so they would be able to explore that concept, but it never happened. That’s why I LIKED Bobby Drake becoming a CPA. Back in high school a friend and I was sat down and worked out a timeline which blended the Marvel and DC universes and had each character appear in the year they first appeared in comics and then age normally. Heroes retired, the legacy characters really replaced the originals, etc. Maybe it was just extreme mutual boredom, but it felt like it worked out really well and made for an interesting universe. Of course, this was three decades ago, so there were only about a third of the heroes there are today. With regards to X-Men & disability, have a few exceedingly academic plugs. The Comics Studies Society has an open call for papers on disabilities and superheroes: the deadline’s June 30, so get on that. The University Press of Mississippi has a book titled “Death, Disability, and the Superhero” which might be good reading. caveat: I don’t know how good the book is (as I skimmed it for thesis work) but I know that there’s an article comparing 1960s X-Men to 1960s Doom Patrol. Huge fan of the podcast, first time poster. I discovered ya’ll about a month ago and have been binging on the podcast ever since (up to episode 65), while at the same time getting and reading as many of the X comics as I can. I kinda feel like my brain is about to x-plode from all the info, but as a lifelong comic book fan, I want more! The biggest thing that I drew, right away from the podcast, was how big of a contribution Claremont made to the franchise. He essentially was the franchise ever since Giant-Size #1, up until I started reading comics in the 90s. I never realized this until I started listening to Xplain the X-Men! In one of the episodes, I believe Jay refers to a documentary that is worth watching called “Claremont & the X-Men”. I was wondering, is this the documentary you recommend? Are there any other good documentaries about the creators of X-Men? That’s the one, yeah! It’s also the only X-specific documentary I’ve seen, although I’m sure there are other good ones. Any suggestions, listeners? It’s prose rather than video, but I can hardly recommend Marvel Comics: The Untold Story too highly. 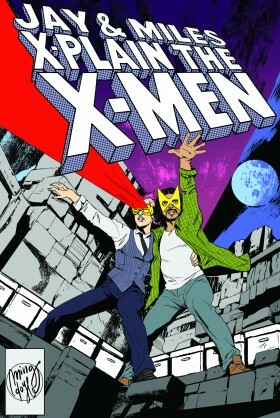 It has a good amount specifically about the X-Men, and a lot of really revelatory context. A joy to listen to, as usual. I wish G. Willow Wilson and Al Ewing were writing X-books right now só you folks could bring them more times, really enjoyed their presence and insight. I am also in the “Spiderman is married” generation. I specifically bought all of the “Renew Your Vows” Secret Wars comics in the hopes it would send a message, and I am patiently waiting for our generation to take over Marvel editorial so Peter can renegotiate that deal with Mephisto. First time poster, and I finally caught up to all of the Podcasts! I just wanted to drop a line in and say you guys are awesome. I love it all from the cold opens, to the x-men table top games, to the compelling interviews. Not to mention of course the amazing rapport you both have. I found the podcast a month or two ago and I’ve been binging at work ever since. You guys are really entertaining and beyond that I’m catching up on tittles and characters I never really had a chance to follow or fall in love with. You guys rock and just keep doing what you’re doing. Feels like there was a pregnant pause in the opening were the audience should have shouted out in unison “Because it’s about time someone did!” instead of applauding and cheering. Any reality in which one is a space pirate is a happy reality for that person. My favorite is AOA (the original, not the subsequent prequels/sequels). Yay for the Dino-Rachel shout-out! Even with the de-aging/magnets/etc. thing, though, as we get further removed from the Holocaust, to the point that there are no other Holocaust survivors left living, I feel like being a Holocaust survivor will be…I don’t know…different….It won’t be any less of an essential character trait and the Holocaust won’t be any less of a vastly important event in human history, but. . . I don’t know, I can’t quite articulate it, but being the only living survivor will feel very different.